The pads labeled "BTN" and "EXT" are to allow for the addition of a remote button. This is another optional feature because no other frame has this incorporated design. 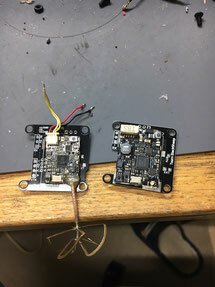 Because the Unify buttons work by pulling down the voltage to read a "press", I have added a pad so the "hot" side of the button can be wired to the board via "BTN" pad. On the LED back plate of my current frame, the Riptide, I have a button which connects to the "EXT" pads on the mounting board. This simply adds another button in parallel with the Unify Pro video transmitters to allow access from the outside of the frame. If you are not using SmartAudio, then this is extremely useful for swapping between channels.